Fancy some really colourful sunflowers to brighten up the home? 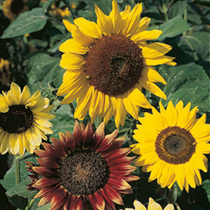 Sunflowers do make very effective cut flowers with the range of colours and flower forms available. We have also selected varieties with long stems for cutting. RHS Perfect For Pollinators. Height 120-140cm (4-4½'). Easy to grow. HA - Hardy annual. Note: Seeds are edible and also ideal for ornamental use.